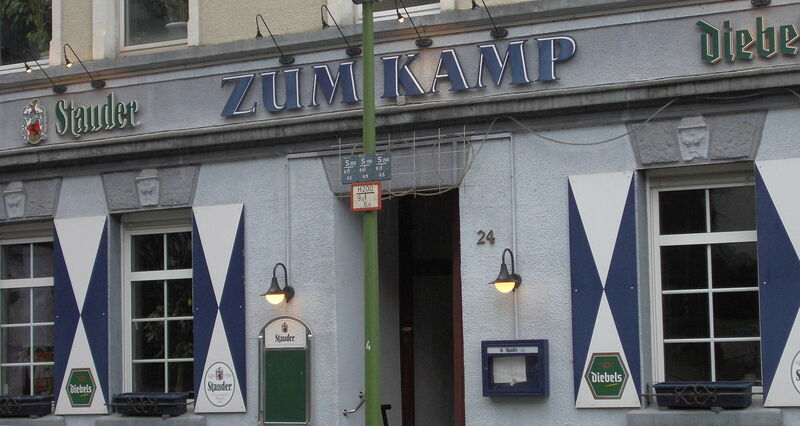 The pub Zum Kamp already exists for 111 years. In 1902, Wilhelm Spieß took possession of the restaurant after his father’s death. Spieß engaged in the worker’s movement of his time. In the immediate neighbourhood of the pub he founded several worker’s organizations. In addition, he was a member of the Social Democrat Party (SPD) since 1903. After the Nazi takeover in 1933, things got uncomfortable for the publican and his guests. House searches led by public officials, restrictions concerning the right of use of the building accommodating the pub and further harassments were on Spieß’s agenda, influencing and disturbing his everyday life. But for what reason the Nazis had an eye on Spieß and his little pub? The answer: even since the foundation of the restaurant, it served as a meeting point for trade unionists and socialists. Underpinnung this fact, a sign dating from the pub’s period of founding read: Verkehrslokal der freien Gewerkschaften u. sozialistischen Parteien (engl. : „local of the free trade unions and socialist parties“). Furthermore, the very first unionist library had its origin in Spieß’s pub. Following the ideal of the reading worker, the publican launched the library with some comrades assistance. Starting off with 70 editions in 1911, seven years later, the library contained already 2000 editions. The number of readers rose meanwhile up to 10000. Due to the lack of place, the library finally had to be outsourced. In 1930, Spieß’s collection of books joined to the district library and moved to the former Wisthoff villa. After Nazi Germany’s defeat in 1945, this pub deeply rooted in the labour movement played once again a crucial part. On 25th August 1945, Essen’s branch of the Social Democrat Party (SPD) was newly established in here. Within the framework of the Nazi’s bringing into line all other political forces in 1933, the SPD as well had been forbidden and its members had been persecuted and arrested in concentration camps or jails. Regarding the example of the Zum Kamp, it is possible to retrace the difficulties people in oppostion to Hitler had to deal with. This is valid especially in view of people engaging in leftist organizations such as the SPD or the Communist Party (KPD) during this nasty period of German history. Many of those fighting for better conditions and a just society had to pay a high price. To be fair, persecutions and humiliations with a political background also occured in the case of conservatives who refused to back Hitler after his rise to power. Simultaneously, the success of this leftist library established in Essen-Steele demonstrates that social democracy managed in a an impressive manner to satisfy the thirst for knowledge of the working class. A success story to be continued in the course of the 20th century. 1) Imagine you found yourself again inside this pub on 25th August 1945. You met up with your comrades, willing to launch again Essen’s branch of the Socialdemocratic Party (SPD).12 years of Nazi reign are gone, and in spite of the ruins around you, you’re confident that a hopeful future is about to come. Draw up a brief document which refers to the future aims of your party, taking as well a note of the socialdemocratic victims perished by the Hitler fascists. „We shall never forget our fallen comrades“ speaks a friend of yours on the matter. 2) „Reading worker? What’s the point in that?“ People may have reacted this way facing Spieß’s worker’s library in Essen-Steele. What would you answer?